Christmas decorations, food and music shouldn’t be played before the 4th of December. For the past couple of years I have stopped using shops that started “celebrating” too early, unfortunately this now means I can’t set foot in a shopping mall until December. 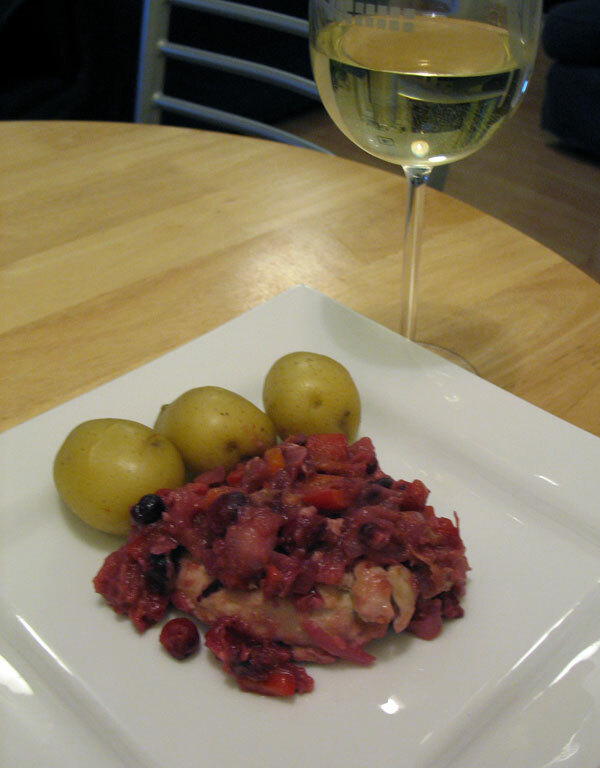 So you may wonder why I am blog a cranberry dish so early in November? Well the truth is when I saw these fresh cranberries in the supermarket, I had such a hankering for this recipe, I just had to make it. This inspiration for this recipe came from a dish my Mum makes at some point between Christmas and New Year, after all the extended family has gone back home, and we’ve finished most of the leftovers. 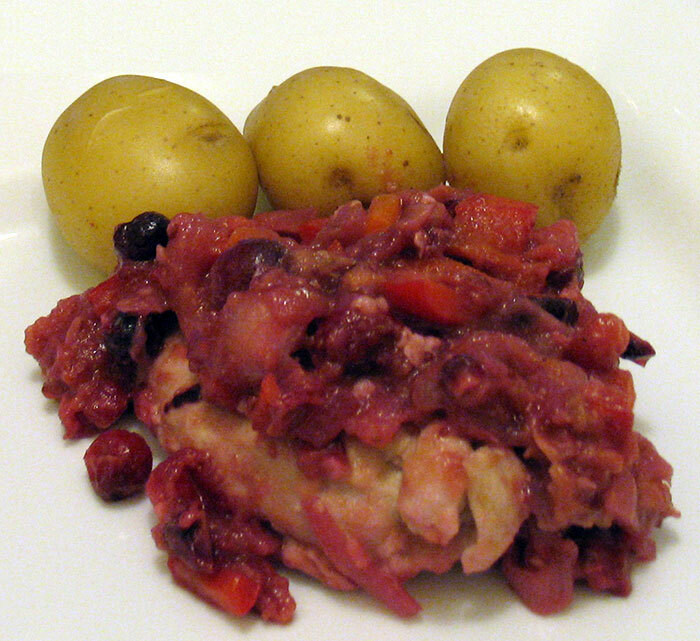 It’s a great dish to use up leftover cranberry sauce, either homemade or from a jar. For the cranberry sauce you can either make your own using the recipe below or use leftover cranberry sauce, you will need around 1 cup. Add the olive oil, onions, chopped garlic and red pepper to a medium hot frying pan, cook for around 5 minutes until starting to soften. Brown the chicken the pan for a couple of minutes on each side. If you are making your own cranberry sauce from scratch add the cranberries and water to the pan, leave to simmer for 10 minutes. If you are using leftover cranberry sauce continue to cook the chicken for another 10 minutes, stirring to ensure the onions don’t burn. The sauce should have begun to reduce now, add the teaspoons of sugar one at a time, tasting until it doesn’t taste too bitter. Add the parmesan in so it starts to melt. Pour in the wine and leave for another 5 minutes. If you are using leftover cranberry sauce add it now, and cook for a further 5 minutes, adding water if it looks like it is drying out. Serve with new potatoes, veggies (I added brussels and broccoli) and a glass of wine. The other half has given me free rein to make this dish again, as often as I like. So I think this may get a good few outings before the end of the year! You might also want to try omitting the parmesan in the sauce and instead for the last two minutes of cooking adding a thin slice of brie to the top of each chicken breast.